Apparently, subtweeting in a passive-aggressive manner probably isn’t the best way to win “roommate of the year” in the college dorms as Pennsylvania State student @JessyJeanie recently learned. Earlier this week, she discovered her roomie had been Tweeting all about their uncomfortable living situation, including the fact that she didn’t totally love sharing space with @JessyJeanie. So, in this virtual world where people say whatever they want about someone online, what’s a girl to do? 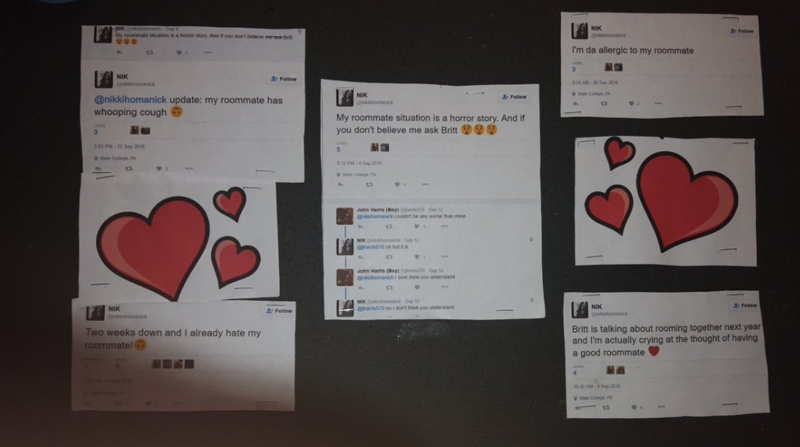 @JessJeanie took action by printing the subtweets out and hanging them on a visible bulletin board in the dorms for everyone to see, in addition to tweeting about it! Talk about a double-whammy! Obviously, the roommate in question wasn’t stoked about being found out since the tweet went viral. In fact, it only escalating things by further involving the Resident Assistant, others students, and even campus police. It just goes to show, think before you post anything online because no matter how careful you think you are, someone is always watching. Fighting fire with fire is not the way to go about it — but we get why Jessy Jeanie was hurt. This hasn’t been the only roommate drama we’ve heard about lately. A couple weeks ago, future UCLA student Winnie Chen and her friend were sent a really rude letter of demands from their future roommate. The letter, of course, went viral. This just goes to show that if you’re going to be really mean, your actions just might end up on the internet. Yikes! We hope everyone works out their issues.